And the rain came down . . .
Oh dear, oh dear. Oh dear, oh dear, oh dear. Recording of sections in the new extension. It has rained and rained on the Ness for most of the day. And not your ordinary, common-or-garden drizzle. This stuff came down in big lumps, from black clouds which refused to budge from overhead. Down by the side of the Stenness loch, there is a sign warning of overhead line danger for fishermen carrying carbon poles. One false move and the fishermen’s rod has connected with a great deal of electricity and both he and his fish have been fried. In tumultuous rain, like today, there may well have been a danger of lightning strike to Adam’s enormous camera-on-a-pole. Luckily, he decided not to risk putting it up, but various areas of the site are ready for photography, including a major photoshoot planned for Structure Twelve, which now must take place tomorrow. Rain forces a hasty retreat from site. 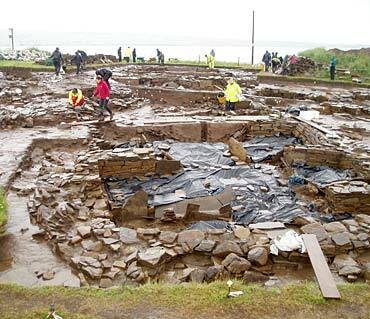 The first task in the morning will be, of course, to bail out the various puddles which will have inevitably connected, and to clean various rain-sodden areas of the site back to the state of pristine freshness which normally greets us. The detailed recording on Structure Fourteen, which took place before the rain strike yesterday, will continue tomorrow and Hugo and Jim are looking forward then to removing the remaining burden and exposing the floor plan of the building. Hugo was busy enough today when the rain fell relentlessly as lunch ended, giving him an ideal opportunity to demonstrate underwater flint-knapping. An engrossed crowd gathered round him to watch his deft movements and at the end he had produced a beautiful flint tool and proved beyond doubt that flint is waterproof while flint-knappers are most decidedly not. Mike investigates a construction cut for a robbed-out orthostat in Structure Ten. 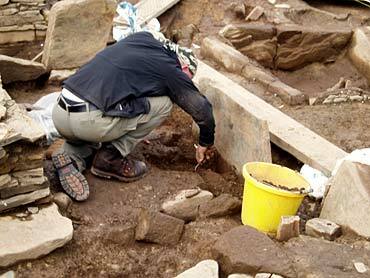 In Structure Ten, Mike was excavating the construction slots for some robbed-out orthostats and found, in one of them, two large lumps of haematite – the iron ore which forms the basis of some of the red colouring we can see on some stones and pottery at the Ness. We have spent some time telling folk that haematite comes from the island of Hoy, but one of the UHI Masters graduates, Chris Gee, found some on a beach on Mainland Orkney recently, and has given us all a good idea of what the colour would have looked like all those years ago in the Neolithic by smearing it on non-archaeological stone on the site. 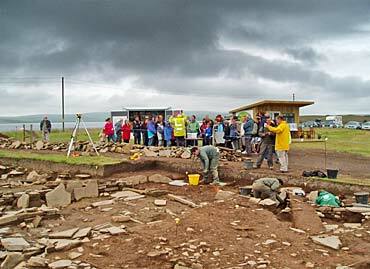 Despite the weather, visitors came by in huge numbers today, no doubt spurred by a repeat of Neil Oliver’s programme on the Ness on BBC2 yesterday. Under ominous skies, crowds gather for the first tour of the week. Those who missed it will be able to see it again on BBC i-Player for the next week, although it is high time that the BBC issued it for sale as a special DVD. We know the market is there. One of our most welcome visitors today was Ann Clark, one of the country’s most eminent lithics (stone tools) experts. New diggers have arrived on site and it is a shame that their welcome from the weather was so miserable but it will almost certainly improve tomorrow — on the grounds that it could hardly be worse than today. 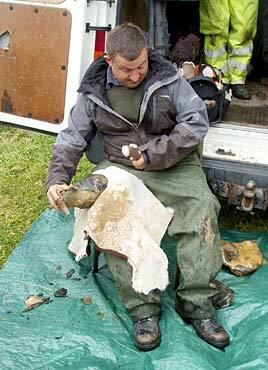 Hugo demonstrates the art of flint-knapping. Hello, all. My name is Dustin Daniel and I am one of the students here from Willamette University in Salem, Oregon. I’ve been on the site now for just a bit over two weeks and today is the first day that we have really had any issues with the weather. We’re currently in the middle of an extended lunchbreak while we wait for the rain to pass, but are kept entertained by Hugo’s flint-knapping demonstration. During one of our pre-departure meetings back in the United States, we were told by our supervising professor, Scott Pike, that this dig would spoil us, as we may never be on such an extraordinary dig again. How right he was. I have been told countless times by others also participating at this site, that they have never been a part of anything like this. 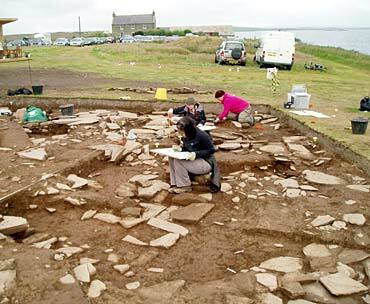 I have heard stories of digs from across the globe and I have yet to hear of one that has matched up to being here for just one season at the Ness of Brodgar. Whether it is the people you meet, the knowledge you gain, or the items you find while excavating, it is a truly great experience to be a part of this dig that can’t be matched. As for the weather . . . it could be better. It looks like we’ll be closing up shop for the day. I’ll take this site, with the rain, any day.